Linda asked, "When should I take my Social Security? I will turn 57 this year and have a strong earnings history, having paid into Social Security for nearly 35 years. Given the year I was born, my 'regular' retirement age for purposes of Social Security will be age 67 but I can take 'early' benefits starting at age 62 or even wait until age 70. Which is better for me?" The average American retires and receives Social Security to cover part of his or her retirement expenses. A typical Social Security payment replaces approximately 40% of your pre-retirement income. To qualify for Social Security, you need to have contributed to the fund for 40 quarters or 10 years. Your Social Security payout will be dependent on your highest earning years. In the 1980s, Congress decided to slowly increase the age for full Social Security benefits from 65 to 67. For anyone born after 1960, the full Social Security retirement benefit is available at age 67. Based on the tables, at age 67 Linda would qualify for $2,451 per month (in current dollars). If she waits until that age to start payouts, she receives a larger amount than if she selects an early payout at age 62 and it will be adjusted for inflation. The favorable news for Linda is that she would receive this larger amount plus cost-of-living increases for her lifetime. In addition, if she works after age 67, there's no reduction in her Social Security payment. She can continue to receive the full income of her work and the Social Security benefit. Of course, because both she and her employer are contributing to the Social Security system while she is working, her actual Social Security benefit is significantly reduced. Her Social Security payout will be taxed and her net after-tax benefit will be reduced. Because Linda is still working, she is contributing about $600 per month of after-tax income to Social Security. Her employer is also contributing a similar sum. The net Social Security benefit to her, after payment of income taxes on her contribution and the contribution by her employer from her salary, is now approximately $300 to $600 of added after-tax monthly income. Linda could join many Americans and start taking payments when she is age 62. Based on the current Social Security tables, her maximum payment would be 30% lower than the full benefits she would receive at age 67. This amount will be adjusted every year based on the Social Security cost-of-living increase. While her benefit is adjusted for inflation, the actual value or purchasing power of this amount will not change. Linda's mother is still living and her grandmother lived to be 96, so she may be wise to plan for a fairly long retirement. There is one other challenge for Linda. If she continues to work, and many individuals do work until their late 60s, she will lose part of her Social Security payment. For every $3 in income (over an indexed limit) she earns between age 62 and her full retirement age, she loses $1 in Social Security benefits. By taking her payment at age 62, she receives both a lower payout for her lifetime and reduced payments for the years until her full retirement age. If Linda continues with her present employment and does not need her Social Security income, she can receive an increased benefit by delaying the start of payments to age 70. The benefit starting at age 70 for Linda is currently 24% higher than what she would receive at age 67. With inflation adjustments, Linda's benefit could be even higher by the time she reaches age 70. This represents a significant increase over her normal retirement amount. The amount increases by about 8% per year because the government has held her funds longer and she has a shorter period of time before beginning to receive her payments. If Linda lives to her mid-80s, then she will have received a greater total Social Security benefit. If she joins her long-lived relatives who have survived to their mid-90s, her net economic benefit from Social Security by delaying the first payouts to age 70 is dramatically greater than her total payouts starting at age 62 or 67. 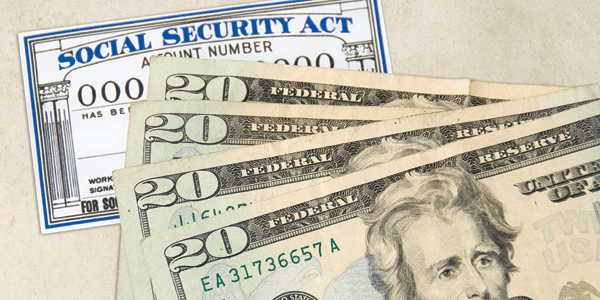 Individuals with lower incomes do not pay any federal tax on Social Security. Generally, single people with incomes under $25,000 per year do not pay tax. For many Social Security recipients, their income is in the middle range and 50% is taxable. For example, a single person with taxable income of approximately $25,000 to $34,000 would pay tax on half of his or her Social Security. The taxable income is called the modified adjusted gross income and includes adjustments for some types of tax-free income. Because Linda has a substantial IRA, she expects to have a higher level of income. With other pension income and IRA income, Linda anticipates a modified adjusted gross income of over $36,000 per year. As a result, 85% of her Social Security is taxable. Linda is not very pleased with this plan. Because she already paid tax on her half of the Social Security, she feels that this is a very substantial tax. However, with the increasing need to fund Social Security in the future, the high probability is that Linda will pay tax on 85% of her Social Security during her lifetime. A spouse may have different options for receiving Social Security. First, if he or she qualifies based on employment, then the best choice may be to take his or her normal benefit at the selected retirement age. However, a surviving spouse can receive a reduced spousal benefit starting at age 60. At a later date they may transition to a full benefit under their own qualification.